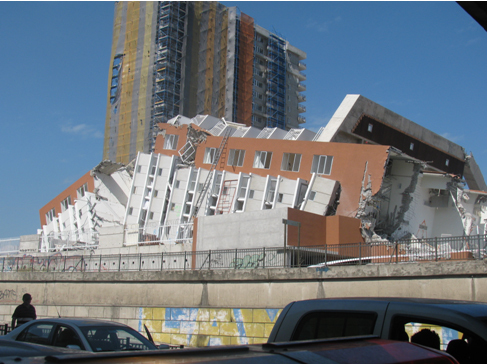 New York - On February 27, 2010 a powerful earthquake struck Chile. It was the strongest quake in the past 50 years. The Fund for Assistance immediately opened a campaign to raise money for the ROCOR mission in the country. Since then, we have raised and disbursed over $11,000. FFA: What is the current situation in Chile? The earthquake did not affect the whole country. Concepción and coastal villages suffered the most. So far only residential buildings have been repaired. Structurally damaged buildings will have to be demolished... 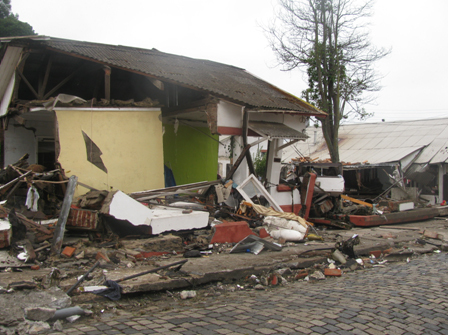 Some buildings in Concepción have police protection around them so no one enters, because of the danger of collapse; since we do not know when new aftershocks will occur. As I’m writing this, the earth moved once again, reminding us of the fragility of life. Schools were open three months after the earthquake. Public services are restored and in the face of the coming rainy season, authorities are working to provide small wooden houses for those who lost their homes. Since March we have had a new Government, and it is working intensively on humanitarian programs, removing debris, fixing roads and destroyed bridges. FFA: How are you and your family dealing with post-traumatic stress? 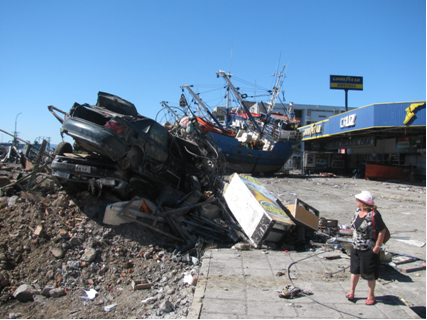 Every Chilean lives through at least two earthquakes in his or her life. Maybe in 50 years our children will experience a new earthquake as strong as the one in March (?) of this year. We thank God because despite this tragedy, my family is fine. The house my family rents withstood the earthquake, but everything inside it was destroyed. Today it is more difficult to rent a house because the prices of those that withstood the earthquake are higher now, and people do not want to live in tall buildings. I restarted my old job at the Educational Institute, but my salary has been lowered and now covers only 40% of the family's needs. There are always delays in payment, but we always hope that tomorrow will be better. Church, prayer and celebration of Liturgy, as well as visiting our parishioners has been a great blessing. I work with the community, listening to stories of our brothers’ suffering, encouraging them to hope; I visit the sick. This has helped me overcome the stress. At school our children participate in musical and recreational activities that benefit many. FFA: What are the feelings of those who survived the earthquake? Every day people see ruins, destroyed streets and collapsing buildings. We are in constant fear of more aftershocks: they say it will take another six months for them to stop. Almost daily gentle movements can be felt, always preceded by a strange noise. People are still scared. Our people still suffer from burglars and looters – this is something that did as much damage as the actual earthquake. However people are overjoyed to have survived. Everyone wants to talk about their experience. FFA: What kind of damage did your mission sustain after the earthquake? Our mission does not have a church in any of the three cities in which it has a presence, neither does the mission own a house of its own, but this experience will help us take precautions for when, with God's help, we build our churches. FFA: How are the members of the mission doing? They are grateful to God. Parents see their children alive and well, and it brings them joy and gratitude. Many people died, but thankfully, not among our parishioners. However, some students and residents of our community are dead or missing. Our parishioners and my family are making efforts to show solidarity and give comfort as much as is possible. FFA: How have you been able to use the money FFA sent you? The money we received from the Fund for Assistance has been a great blessing. a) To help families who have not yet been able to start their jobs. b) To finance membership to the YMCA for some children and young people to help them overcome the effects of post-traumatic stress. We have also helped with school expenses. c) We have helped families needing to make repairs to their homes; they have also been helped with food and clothing. d) We have helped with emergency medical expenses. e) We have created a small fund to cover costs of our mission in Chile, for example, to cover the cost of transportation. f) To cover, for a few months, our family’s expenses - a family that is at all times in service to the Church. FFA: What are your plans for the near future? We hope that the city will be rebuilt in order to function normally. I hope to have more work at the Institute or at a University. Our mission is awaiting a response from our government regarding assistance in the development of a cultural and spiritual center for the Russian Orthodox mission in Chile. We hope to bless the first stone of the future church in Concepción. We also hope to get a new priest to better meet the needs of our communities. We are working on a Web site, www.misionortodoxa.org. We hope to show the world what we are, what we do and what we want to do. We want to present our dreams and hopes and to offer some services that could help us in the economic development for the good of the mission. I would like to express our gratitude to the Fund for Assistance and to all our brothers and sisters who have helped us with their donations. We offer our humble prayers for you at the altar of God during every Liturgy. We have received and felt not only monetary aid but also Christian love and spiritual closeness. If you ever come to Chile, here there will be a group of brothers and sisters that will welcome you with much love and gratitude in Christ.